If you are planning a wedding many congratulations.I would be delighted to offer you a free no obligation consultation, I can help you design you'r wedding cake or if you already have an idea of what you are looking for I will be more than happy to discuss this with you, we also offer a setting up service at your ceremony and can also provide you with a cake stand and knife, this is all part of our service and is free of charge if ordering my products and services. 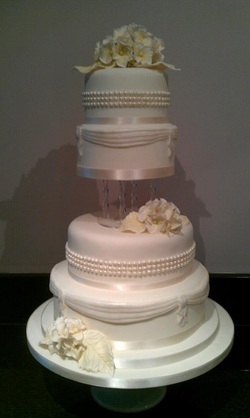 Our wedding cakes can be made in either fruit or a selection of flavours including Vanilla, chocolate, lemon, orange. If, however, you would like to go for a tower of cupcakes, individually made to suit your own personal requirements. We can provide both standard and canape cupcakes in any flavour, co-ordinating with your wedding colour scheme and theme. We also offer top tier cutting cakes in luxury fruit or a choice of sponge - again the choice is yours. Your wedding day is a special day and we work with you every step of the way to ensure the colour, design and taste meets your exact requirements. We can co-ordinate boxed cupcake canapes with those on the Wedding Tower to add an extra special touch for all of your guests. This we offer in either light or dark fruit as well as a choice of sponge in either Vanilla, Chocolate, Lemon or Coffee and will be decorated, along with the rest of your order, to match the colour scheme and theme of your wedding. Choose from a selection of cases and wrappers again to match your colour scheme and theme. We are happy to provide you with samples if required. We do have stands to hire, however, we waiver the charge if we are providing your cake/cupcakes. We only ask for a £30 refundable deposit. All stands must be returned within 7 days of hire. Your cake/cupcakes will be personally delivered to your venue and set-up as necessary on the day of your wedding, all ready for the moment you walk into the room. We ask that on confirmation or your order a deposit of 30% will be required with the remaining balance to be paid 3 weeks prior to your special day. More wedding cakes can be viewed in our gallery.